Remove existing crankset and any external bearing cups. Clean the BB area and threads. NOTE: The right side (chain side) is left-hand threaded, turn clockwise to loosen. Left side bearing cup is normal (CCW to loosen). Route Cycle Analyst and battery cable to the area, leave loose until final fitment. Pull off the loose bearing cup from provided ISIS BB (this is the left side cup). 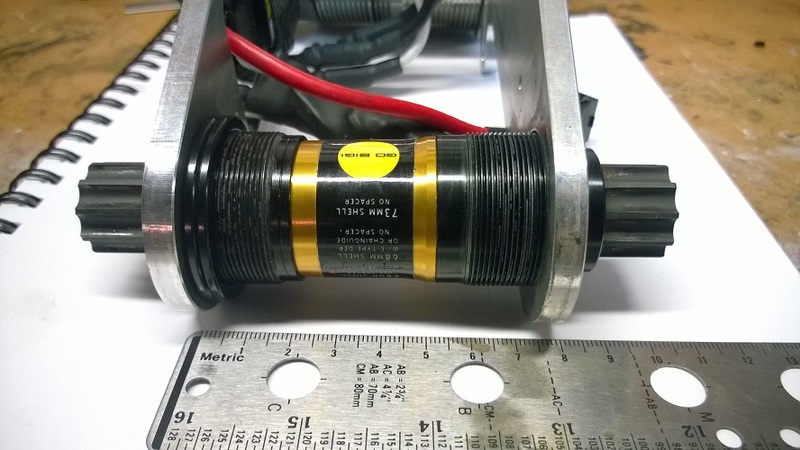 Insert BB spindle from the right side through the drive mount, thread bearing cup CCW several turns into your frame. You can now hang the drive unit from the spindle. Tighten left and right bearing cups most of the way, leave 2-3 turns loose. The cups should easily thread most of the way by hand (unless Locktite is present). TIP: Alternate screwing in the left and right cups 5-10 turns at a time. Walking both cups in simultaneously helps prevent binding and damage to threads. 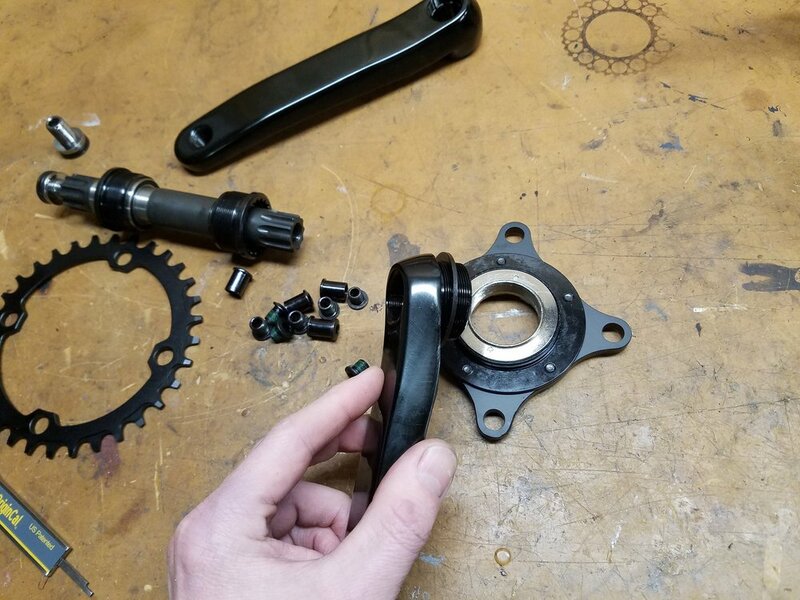 Rotate the drive unit up into the downtube or seat tube and lightly tighten the left and right bearing cups to hold the unit up. Push the unit against the downtube and gently tighten the left and right bearing cups (tightening the cups will try to rotate the drive against the downtube). There are three mounting options to provide a clean fit for most frames. The rubber cushion and metal strap can be used in any of the three holes. Push the unit against the downtube and tighten the left and right bearing cups to 35ft-lbs (tightening the cups will try to rotate the drive against the downtube). Affix the rubber padding to one of the three lengths of metal strap provided and bend around your downtube. Use the range of adjustment to create a snug fit and tighten the 5mm allen bolts to 5ft-lbs. As the drive is used and the rubber cushion compresses, this strap may need adjustment. Install the spacer with stepped side towards freewheel, lightly thread the freewheel fully onto the crank. The included 32t chainring is used with the motor and mounted in the outer position of the 4x104mm BCD spider. Mount the chainring of your choice to the inner position. 32t recommended for most applications. Always use a narrow-wide style chainring to help prevent dropped chains. 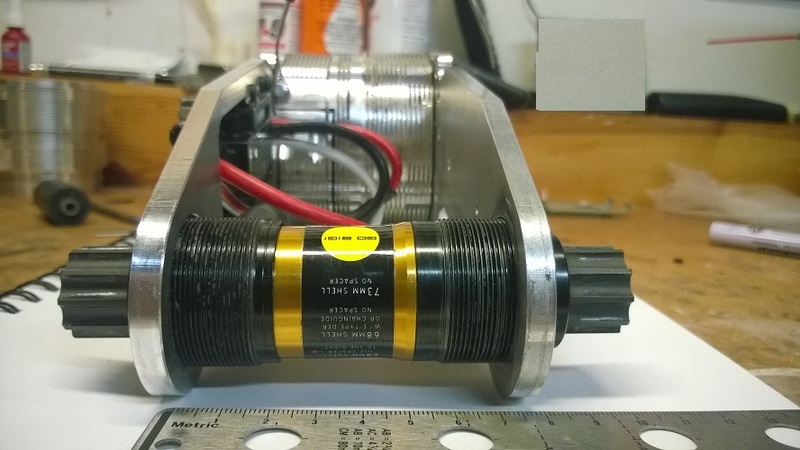 With the crank bolt fully tightened to 35ft-lbs, the motor output will align with the outside chainring. The inner position produces a chainline of 12mm outboard of the BB face. Install spring tensioner, derailleur chain on the inner position then motor chain on the outer position. 90deg RCA - battery pass-thru for lights, etc. NOTE: if the temperature sensor line becomes disconnected, the Cycle Analyst will not allow the motor to run and will flash a temperature reading of 1100C. If this occurs, check both 2pin connections (behind display screen and near the drive unit. Use Locktite, semi-permanent blue. The housing is anodized aluminum and fasteners will tend to loosen with use. Check the 8mm crank bolts tight every 5 minutes after a new install and periodically even after they begin remaining tight. 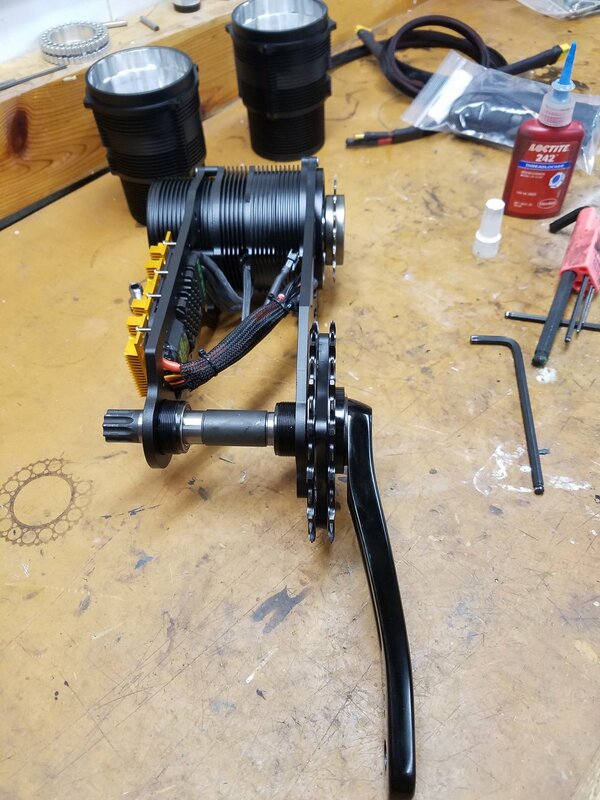 The ISIS cranks are intended to sit flush with the shoulder on the spindle as they wear in; the first time installing new cranks onto a new spindle this may not be possible- just keep checking the crank bolt tight at 35ft-lbs until the crank seats fully. Check the chainring bolts tight when you maintain the chains. The motor may be rotated within the housing to locate the motor wires out of the way for your setup. Don't forget to tighten the 3 clamp bolts. And use blue Locktite. Entering the Cycle Analyst setup menu stops the throttle pulse to the ESC. Upon exiting the menu, the ESC will repeat it's 3 beep code warning of the loss of throttle signal. To reset the warning, the system must be power cycled (unplug the battery for a few seconds).